Denver Hume impressed at Wembley after coming off the bench. Sunderland youngster Denver Hume could be handed a huge opportunity on Wednesday night, with Reece James 'struggling' to be fit for the trip to Accrington Stanley. 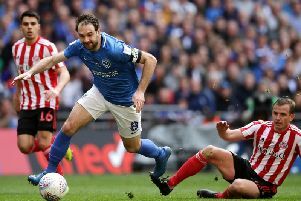 James limped off towards the end of normal time in the pulsating Checkatrade Trophy final on Sunday and is now a major doubt for Wednesday night. Hume took his place at Wembley and had an impressive impact, driving forward on the ball and creating a number of promising openings. Jack Ross is a big admirer of the 20-year-old and he would have played a lot more football this season were it not for a frustrating knee injury. He knows set to be presented with an opening to make his mark in the final nine games of the league season. "He was great," Ross said. "He's been in my thoughts for a while now since he came back fully fit. "For him, I think he's had a really good season. I know that sounds so strange because he had a big chunk [that he missed] through injury but when he got the opportunity to play in the first team he really grabbed it, he was really good. "The injury was unfortunate but he's trained really well and we had a couple of bounce games that he was really good it. "He was getting closer and closer, it was hard not to play him. "He was very close on Sunday [to starting]. To perform as he did was brilliant, he had a real impact on the game and that was terrific." Hume is out of contract in the summer but Ross and Sunderland are desperate to secure a new deal. Ross has been impressed with the way he has forced his way into his plan after emerging in pre-season. "He was in that group if you like, Luke [Molyneux], Elliot [Embleton], Andrew [Nelson], that were involved with me from day one because we had so few numbers," Ross said. "I knew they'd been around the first team before but I didn't really know what to expect from them. "He was one who, really early, just grasped how we trained, how we did things, and just got the bit between his teeth, that he wanted to be part of it. "He really bought into it and the progress he has made has been brilliant. "The senior players really like him and I always think that's a good barometer, they know he's a good player with really good attributes," Ross added. "It's about consistency and improving little bits but for that position, he's got a lot on his favour." Ross also confirmed that Bryan Oviedo is now fit for selection. The Costa Rican is still yet to feature since a deadline day to West Brom collapsed. He has had two calf injuries and a knee problem in that time. "It's been a long road back in that respect, to be able to train consistently," Ross said. "But the last couple of weeks he has done that and it's good timing in the sense that we don't quite know the extent of Reece's injury at the moment." At this stage, however, all signs point to an opening for Hume to grasp.